Run multiple sites from a single SilverStripe install. sharing users, content, and assets between them - the sites will be managed from a single CMS. templates can also be different. All separation of content achieved with this module should be viewed as cosmetic and not appropriate for security-critical applications. The module gives some control over access rights especially in the "Pages" and "Files" area of the CMS, but other sections' separation is much weaker: for example giving someone any of the "Roles and access permissions" will imply that the person will likely be able to escalate his/her privileges to the global admin role. When recovering from a disaster it's much easier to bring up a new copy of a single environment with 100 subsites than it is to bring up 100 environments. Each subsite domain name has to be set up on the server first, and DNS records need to be updated as appropriate. The separation between subsites in the CMS needs to be seen as cosmetic, and mostly applicable to the "Pages" and "Files" sections of the CMS. All subsites run in the same process space and data set. Therefore if an outage affects one subsite it will affect all subsites, and if bad code or hardware corrupts one subsite's data, it's very likely that it has corrupted all subsite data. It is not currently possible to backup or restore the data from a single subsite. It is awkward (but not impossible) to have separate teams of developers working on different subsites - primarily because of the level of collaboration needed. It is more suited to the same group of developers being responsible for all of the subsites. If more isolation of code, security, or performance is needed, then consider running multiple separate installations (e.g. on separate servers). Create necessary tables by visiting http://<yoursite>/dev/build (you should see a Subsite table created, among other things). You don't need to run this command for every subsite. Login to the CMS as an administrator. You should now see a "Subsites" entry on the main menu, access that section now. 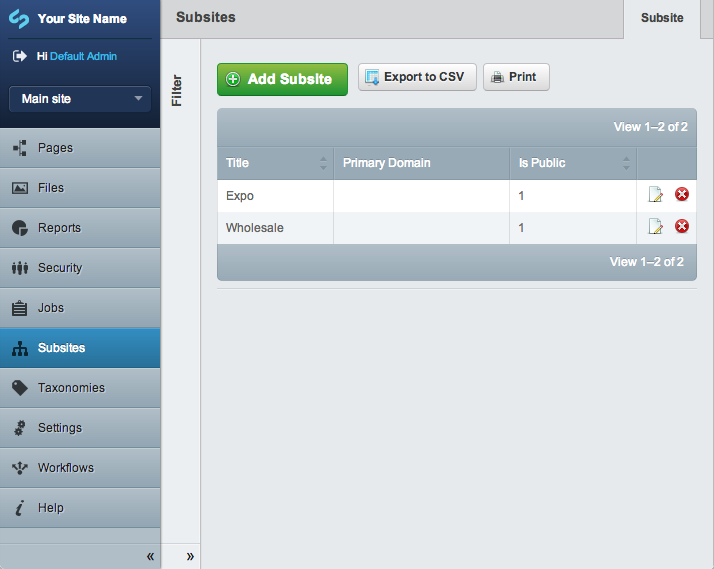 Hit the "Add Subsite" button to create a new subsite. Go to the "Pages" section of the CMS. In the top-left above the menu, you'll see a dropdown listing the two subsites - "Main site" is the original site that you had before you installed the subsites module. Select your new subsite, and the site content tree will be changed. It should be empty at this stage. Add a page - change its title to "Home", and its URL Segment will be changed to "home". Save the page. Update your DNS and, if necessary, your webserver configuration, so that your subdomain will point to the SilverStripe installation on your webserver. Visit this new subdomain. You should see the new subsite homepage. The module tries to provide sensible defaults, in which it regards example.com and www.example.com as the same domains. In case you want to distinguish between these variations, set Subsite::$strict_subdomain_matching to TRUE. This won't affect wildcard/asterisk checks, but removes the ambiguity about default subdomains. only apply to this subsite. level, rather than a fully tight security model for managing many sites on the same CMS (it is still the same CMS). In some Browsers the SubsiteID is visible if you hover over the "Edit" link in the search results of Subsite admin. Download a second theme from http://www.silverstripe.com/themes/ and put it in your themes folder. Open admin/subsites?flush=1 and select one of your subsites from the menu on the bottom-left. You should see a Theme dropdown in the subsite details, and it should list both your original theme and the new theme. Select the new theme in the dropdown. Now, this subsite will use a different theme from the main site. in its settings, in which case it only shows if a user with CMS permissions is logged in. This is useful to create and check subsites on a live system before publishing them.